We’ve seen quite a few of these this year. DIS, LLY, QCOM come to mind. I hold SBUX in the DGI and recently added on that dip in the chart. a definite buy and hold for div growth. 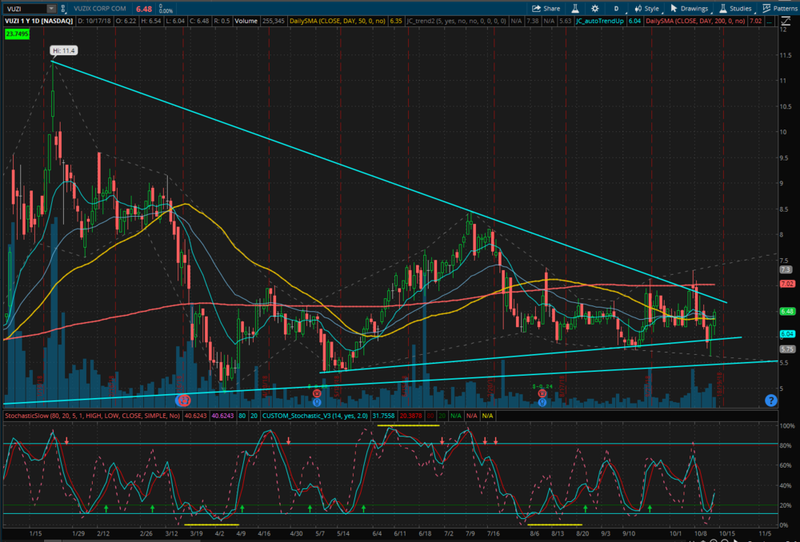 $VUZI may try to break this long downtrend yet again. Keep on watch - roughly 21% short, 23m float. Deserves to be trading much higher here. look for 9’s in due time. another flush on china overnight… this is getting too much. i still think load up - can’t time the bottom but these prices are too low at this point. here’s a 15 yr monthly chart for dow jones shanghai. Another long drought in posts, apologies for that. Vacation + work is keeping me busy. I’ve been eyeing $DJSH for awhile now - dow jones shanghai index. this past week it finally hit the 2016 low line (went slightly lower, briefly). i count 5 waves down so it fulfilled what i was thinking. perhaps the china bear is nearing an end? time will tell… perhaps a trade deal will get it going upward again, but consider this - china has over 6% GDP growth. Yes they slowed from 6.4 to 6.2 (i believe), but thats still almost double the US growth. China isn’t going anywhere, it’s one of the biggest economies in the world (if not the biggest). Baba probably will be $1000 in 10 years. Anyway, charts below, and yes - i bought baba this week! Haven't posted in some time... after the injury healed up I have been busy back at work. still posting to Stocktwits here and there though, so follow me on there if you haven't yet. here's a DGI screener that i'm playing with. with the market looking to extend on a wave 5 here, i want to filter down to lower P/E stocks to add to the DGI. yesterday i added AMNF with a small position. frozen foods, fantastic growth over the years. Set some alerts on this one, check the chart. Would love to grab shares to go long on this (not just a swing). textbook flag here, with the flagpole identical to the breakout move! time to see if it has legs and will continue pushing higher or consolidate a bit. side note: the hip injury is healed and i'm getting back into the swing of things... this week will be light on updates, but I'm very much long on this market. Earnings are looking great, and have expected to be *big*. Keep watching, it's a busy week for ERs. $CDXC great run, ready for a retrace but how much? -or it goes for a decent fib line pullback to the 4.13 area where it would likely meet the 50ma then continue higher. i see the bottom 2 scenarios playing out over the course of week(s), where the top scenario would be very short. i like smallcaps for the 2nd half of the year, and will be sticking with this one as a valid long. $AQMS ready for another leg up? loving small caps for the 2nd half of the year... $AQMS is one of those potential turnaround stories. Bullish behavior from the board lately, and they should be getting more modules online soon. check out the weekly chart. just an update on the index; we can see the channel we're in now, so play accordingly. we have some resistance ahead, but overall i'm still looking for 3k+ this year. Just an updated market chart / wave count on what i'm tracking. obviously this is just one scenario, but seems likely the one that plays out. Economic expansion is very strong, the data shows it. Wages should now start to rise now that it's hard to find employees as we have more jobs available than employable people. My wave counts are not time-accurate btw, they are just estimated into the future. 2800, 2900, 3000 on s&p this year, just a matter of when. let's see how july earnings kick us off! here we've got $HBAN's weekly chart, showing fairly good entry at the bottom of the channel. $SPY $ES_F latest chart, waiting out the tariff tantrum..
Trade war no, trade tiff yes. To be clear, a trade war will eventually lead us into a bear market and swings will likely be small with lots of put option plays. We're not there yet though; fundamentals are still clearly strong on our economy, and it's likely we head to S&P 3k+ this year. Where we go after that? who knows, let's wait to see the political/global climate at that time. here we've got the s&p messing around the 50ma. the flag from the previous post sorta broke down, but the overall picture is we're in a simple pullback from the wave 4 end to the nearest top. This is a good retrace. even the 2692 area is "fine". 2670 near the 200ma would be "acceptable" and if we go there, get ready to BTFD on strong names. Even though yesterday seemed rough, we're still in the flag - implied move is the blue dotted line if we break out of it. Looks to be a setup for monday, IMO. It could also break down of course, so just keep an eye out. Market looks like it's simply waiting for a positive catalyst among the trade war noise. If the market was truly concerned and anticipated bad trade wars, we would have fallen harder by now. Played this one a bit last year, looks worthy for position building long again. good prospects on the company, but the price fell into a slump this year with a big 5 wave down turn. on the long weekly chart, we can maybe get away with drawing a giant cup and handle, so let's see where this can go. on the daily it looks like we have our 5 waves and currently doing an A-B-C pattern. Let's see if we are indeed about to turn up for the "C", which could very well be the start of a reversal wave up.